In the autumn of 2005 the Lower Ninth Ward, a multi-cultural precinct in the east of New Orleans, was flattened by the force of the hurricane Katrina. In the autumn of 2005 the Lower Ninth Ward, a multi-cultural precinct in the east of New Orleans, was flattened by the force of hurricane Katrina. Today this quarter of the city is an enormous wasteland, with nothing to remind people of the community atmosphere of this historic part of the city. 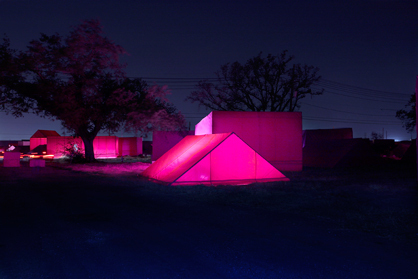 In cooperation with Graft, the Berlin architects, Brad Pitt developed the idea of setting up a temporary township in the main area of the Lower Ninth Ward – a memorial partly to the random destruction of countless homes and partly to the right of the area's residents to their former community. 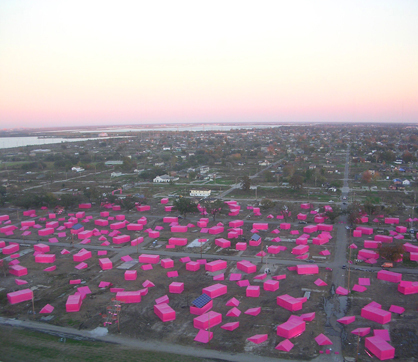 The installation consists of 150 pink tents, which represent the houses which are still to be built – houses which will only be erected with the aid of financial donations. The forceful reminder of the pink city will not disappear until gradually the provisional pink structures are replaced by real buildings. 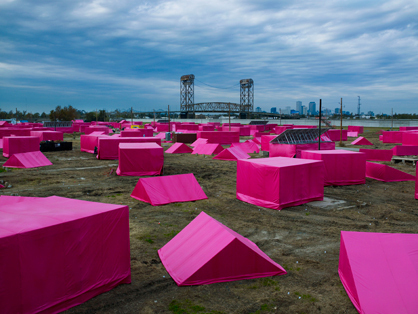 The less pink appears, the more donations have flowed in – a poetic visual indicator, which reflects the effects of the public's sense of responsibility. 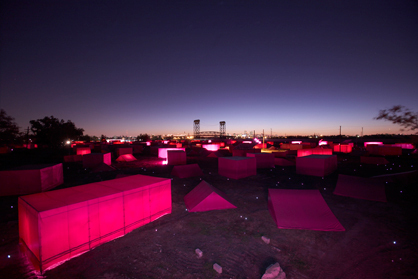 The Pink Project is an inaugural event for the Make It Right initiative, which was founded by Brad Pitt short time after Hurricane Katrina left the enormous devastation. Make It Right supports the substainable reconstruction of the ruined parts of New Orleans.